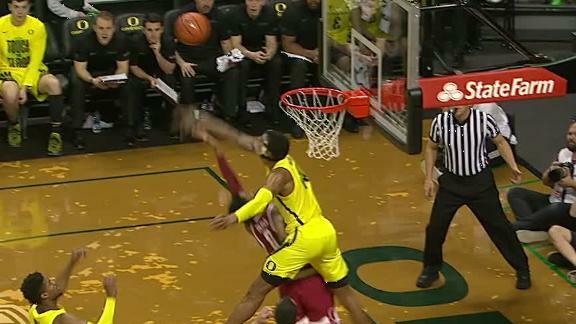 EUGENE, Ore. -- Stanford knew exactly who the masked man was at the center of Oregon's defense. Wooten said he went looking for shots to block after swatting three in the first 4 1/2 minutes. "At some point I'm just trying to hunt down shots and looking for as many opportunities as I can get," he said. "Today it was working. I got those first three early and after that I just kept hunting." Oregon's Kenny Wooten rejects five Stanford shots in first half, as the Cardinal only put up 20 points in the first 20 minutes.